It’s a hard day of this and that and it was just a weekend of non-stop work so I decide to make a comforting creation that I have depended on for generations, mac ‘n cheese. These days I eat less gluten, or at least try to, I find it hard to be gf full time as I like beer after a long day, I love warm baked bread & I cannot resist Neapolitan style pizza. (((It’s sinful to in my opinion))) However, I found there is a great alternative for pasta, Brown Rice Pasta by Tinkyada. I enjoy all their pastas but find the penne & shells work best for this recipe. Preheat oven to 375°. Use a little olive oil to grease a 8″ square glass or cast iron pan. Bring 8 Cups of cold water to boil with salt. Once at a boil, gently add pasta package and set timer for 7 minutes. You don’t want to fully cook the pasta as you will be baking the macaroni later. Once ready drain in colander but do no rinse. While water comes to boil, chop your onion and warm a cast iron pan or stainless steel saute pan, over medium heat. Add butter along with 1 TBSP evoo to coat pan. Stir occasionally & once onion is translucent, add shiitake mushroom with 1/4 tsp salt, cook until mushroom is evenly brown. Add the flour and stir for 30 seconds to create a thick paste (roux). Add warmed milk and stir until a creamy Bechamel sauce appears. Once sauce is thickened add grated cheese in hand fulls and stir to incorporate. Once all but 1/4 C of Parm is added, add salt & pepper to taste, you can try the pasta at this point, the pasta will be a little more than al dente but you want to taste for salt & pepper. Pour macaroni and cheese into prepared glass or cast iron square dish. Top with remaining parmigiano (1/4 Cup) & bake in preheated oven for 20 minutes. If you are like me and crave a crispy top layer, set the broiler on high for an additional 3 – 5 minutes (broilers vary greatly). When broiling things I sometimes sit in front of the oven with the oven door ajar to watch the bubbles and make sure nothing burns. Many of my personal chef clients are gluten & cow dairy free. If that’s your case, easily substitute the cheddar and parmigiano for some goat alternatives (make sure to find a harder goat cheese as the harder cheeses generally add a nice element of salt & complexity). 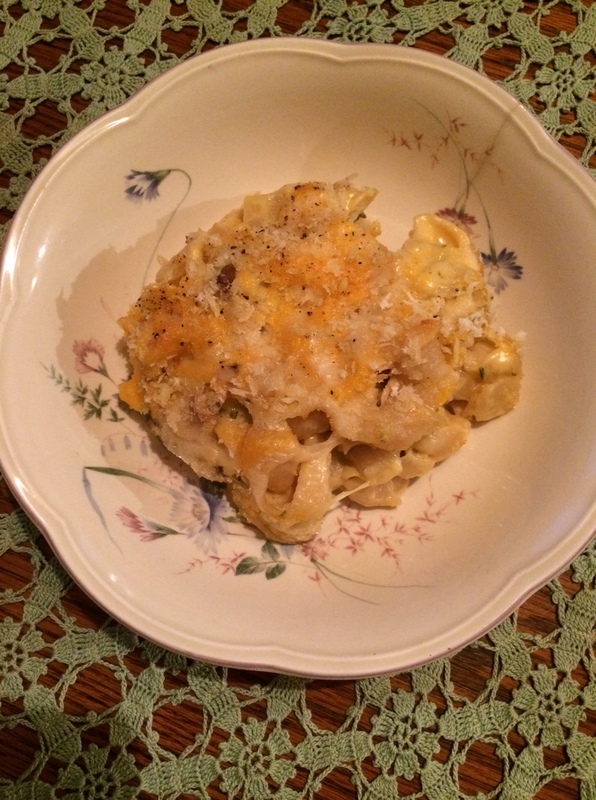 Enjoy on a cold & rainy evening or just cause, it’s macaroni and cheese. it’s never bad.